Set a threshold for free disk space that must be available before a backup operation can start. Ensuring there is sufficient free disk space helps prevent backup failures. To keep apprised of free disk space status, set up the Free Disk Space alert:Alerts > Manage Alerts > Add Alerts > Notify... Advanced > System > Free Disk Space (GB). 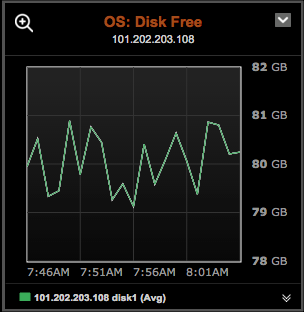 To monitor free disk space on a specific disk partition in a dashboard graph view: Click Add Graph > Add Metric > OS: Disk Free. Click the Configure link for the Disk Space Threshold feature. The Configure Disk Space Threshold dialog appears. Select Do not backup if free space is below % and enter the percentage of free space that must be available before a backup operation can start. 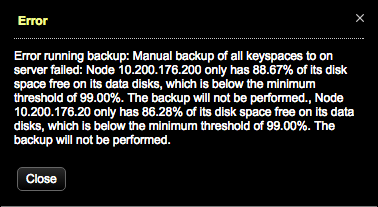 If a backup is attempted when the free disk space is below the configured threshold, the backup fails and an Error dialog displays the free disk space for each node. In addition to configuring the free disk space threshold for backups, set up alerts for free and used disk space to monitor free space when restoring backups.